The recent deadly chemical attack on Syria and the subsequent tomahawk missile retaliation shows no immediate end to the now six-year-long war raging in Syria that has displaced 11 million Syrians outside its borders, 6.6 million within, left 13.5 million actively seeking humanitarian assistance, and has killed more than an estimated 400,000. With this grievous tragedy worsening every day, there are no clear answers as to can be done to rectify the situation, but the following art-initiative groups: The Refugee Art Project, The Za’Atari Project, Castle Art, Skoun, Paint Outside the Lines, Artists for Refugees, and Art Therapy in Egypt have been successfully productive in extending compassion and providing an outlet for the pain and trauma suffered by the refugees currently residing in our communities. They’ve provided a way to unify human beings of various backgrounds and homelands to create something beautiful out of wretchedness and despair. These seven art-initiative groups have brought together local artists, photographers, activists, townspeople, refugees, and leaders to provide solace and hope through art for those affected by the war. The objective is to “provide a way for Syrian refugees to tell their stories” and to “…allow them to tell the world, in a universal language, their desires, their dreams, their lives” says Reza, a famous photojournalist collaborating with UNHCR on the “Dreams of Humanity” exhibition in Paris. We chose one artist from each of these seven projects, all funded by various NGOs, to highlight the unique significance of art for healing. 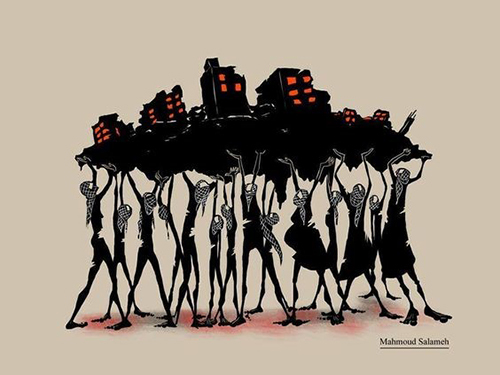 Mahmoud Salameh, a featured artist for The Refugee Art Project, is a Palestinian refugee from Syria who was detained in an Australian detention center for seventeen months after fleeing the country as the war took a turn for the worse. 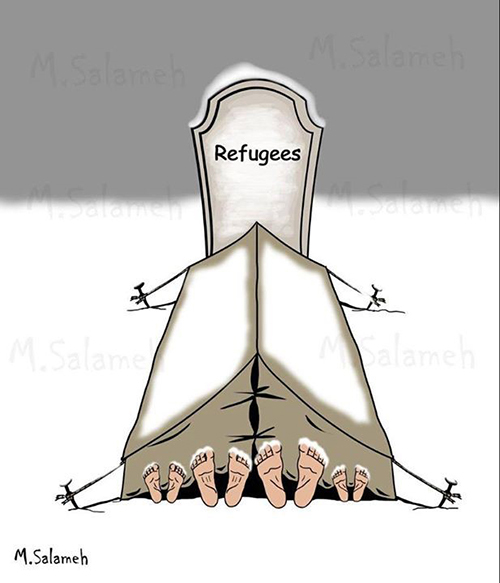 While in Syria, Lebanon, and now Australia, he is a professional political cartoonist who creates controversial, subversive cartoons depicting border imperialism, the experiences of refugees, displacement around the globe because of the ongoing war, conflict between the Syrian people and their government, and the Occupy Palestine movement. 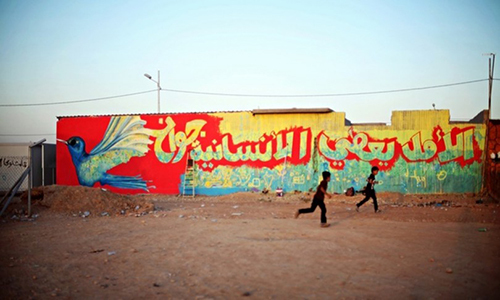 Mahmoud uses his artwork featuring prominent political issues to advocate for the social and political change of mainstream narratives and opinions on the occupation of foreign countries by neighboring ones seeking to control the land and its people, displacement that leaves men, women, and children without shelter and a secure means for survival, and resistance to political and social issues that infringe on human rights. Now an ex-detainee, working in Sydney Australia, Mahmoud Salameh’s fight for justice through his own experiences and for the experiences of others facing similar strife continues. 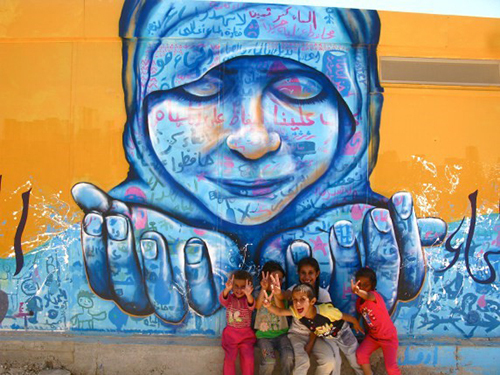 The Za’Atari Art Project is an initiative started by aptART, "an organization of artists and activists . . . [that] aim to share with conflict affected and marginalized youth an artistic experience alongside the opportunity to express themselves." The goal of the organization is "to build awareness and promote prevention [of] the issues affecting people’s lives." 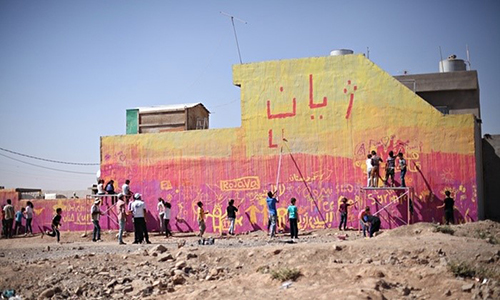 Partners ACTED and UNICEF collaborated with aptART, Mercy Corps, and various local and travelling artists to work with refugee children at the Za'Atari Refugee Camp in Za'Atari Village, Jordan. 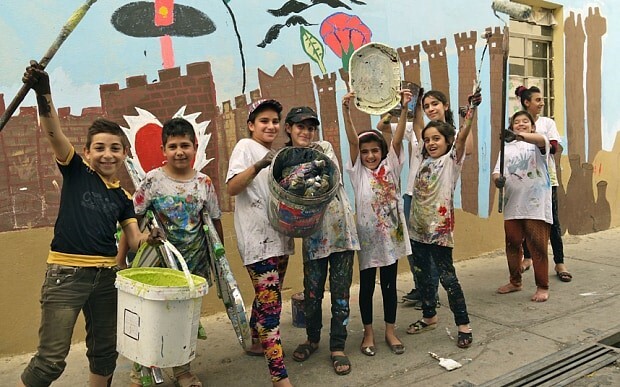 The goal of the project is "to address the lack of arts and culture in refugee camps that are necessary for the enrichment of human experience(s) and [to] provide opportunities for refugee voices to reach out to the world in a positive way to tell their own stories… and improve the lives of children in Za’Atari." ACTED, Mercy Corps, UNICEF, and aptART worked within Syrian refugee camps to bring to the children’s lives vibrancy, therapy, conflict resolution, and discussions of social issues through artmaking to spread the message of hope, unity, and positivity to children in the desolate camp of Za’Atari. These children have been forced to flee their homeland that was once rich with color, greenery, and life, to live in a hot desert wasteland that has not only displaced them, but left them without formal education, culture, jobs to help provide for their families and activities to stay out of trouble. “This project aims to give voice to refugee children who are often forgotten about in the barrage of horrific news stories about the Syrian War. 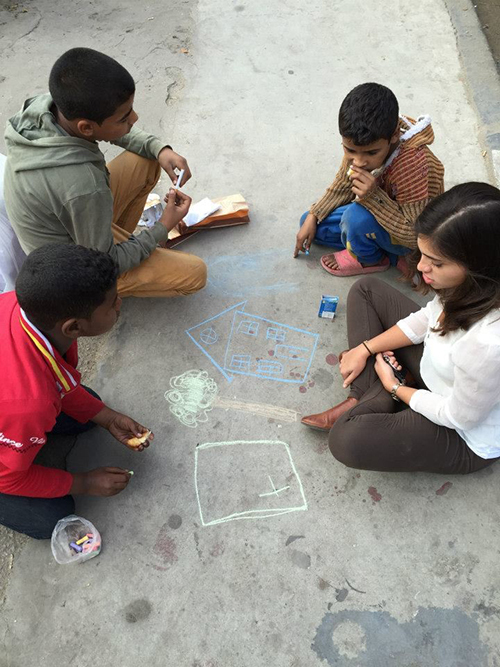 It intends to connect these kids to positive adult role models and involve them in educational and creative activities, thereby playing a role in the rebuilding of their communities” The purpose in this project is to give these children everything that food, shelter, and medical care cannot provide. Not just a means to survive, but a reason to as well. 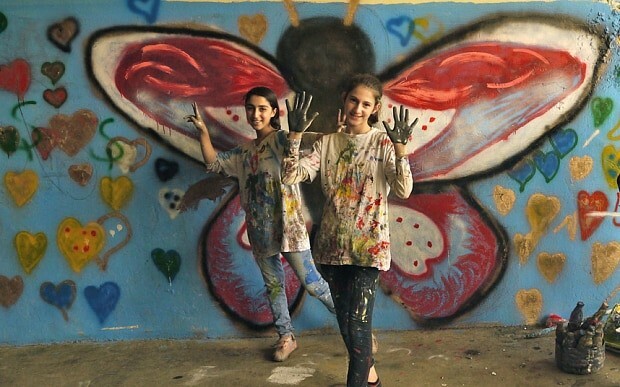 The former Iraqi prison used by the late Dictator Saddam Hussein, is now a Syrian refugee camp named Akree, aka “The Castle,” and is home to fourteen-year-old Newroz, a Castle Art featured artist, whose family fled the city of Damascus in 2012 when the war in Syria intensified. Their journey north towards safety did not initially land them in one of the eight Iraqi refugee camps, but in the Kurdish-controlled northern region that did not alleviate their fear for survival and lack of safety, but worsened it as they realized their new “home” was situated near and oil field which could, at any point, be targeted by ISIS. 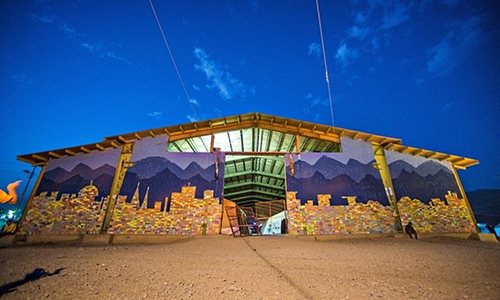 It wasn’t until the following year that Newroz and her family found refuge in “The Castle.” It is difficult to imagine the level of comfort and safety refugees can feel living within the concrete walls of a former prison that enacted heinous crimes against the Kurds during Hussein’s reign, but Newroz’s and the other children’s passion for art and beauty has given them the inspiration to use their creativity to express their emotions through art painted on these once desolate walls. 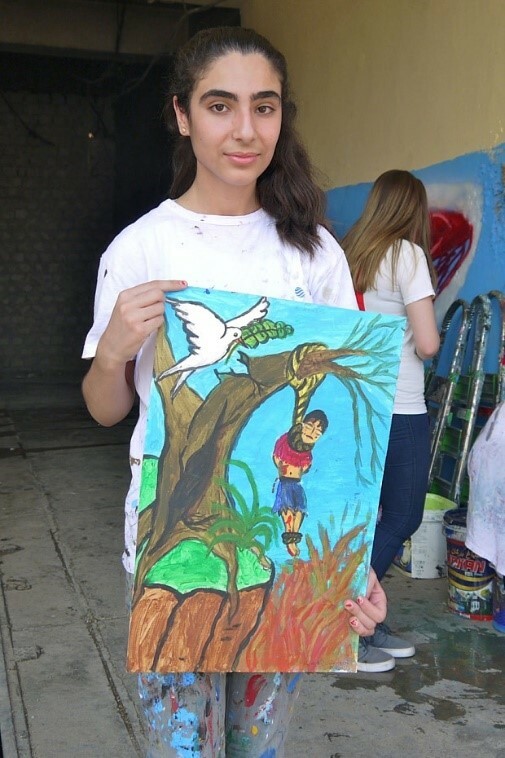 Anna Toutikian, artist and clinical psychologist, has teamed up with The Skoun Association to offer the children formal education, art therapy, and group art projects to help unite the Lebanese and Syrian students as tensions between the two groups rise due to the increasing presence of refugees at the Barja Technical School in Barja, Lebanon. These children often struggle to acclimate to their new surroundings as they are ridiculed, bullied, tormented, and targeted violently by some of their Lebanese classmates. This treatment has made 20% of refugee children drop out of school. 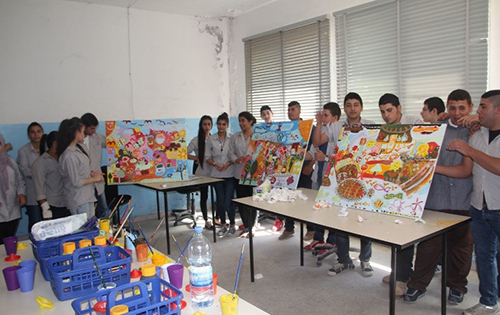 Skoun has chosen to work within the schools of Lebanon to help stop refugee children from joining violent groups if they remain out of school. These Iraqi camps are home to internally displaced Iraqis and Syrian families. 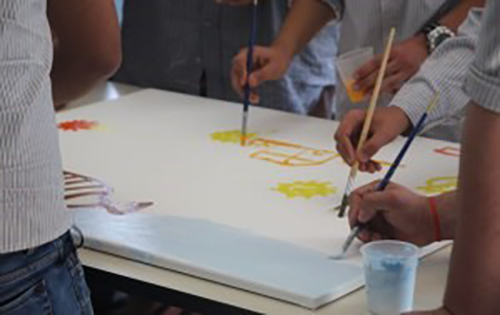 Without the war, these two groups of people would not normally live together, but now that they do, Paint Outside the Lines are working to create a collaborative, unified community filled with beauty, color, and peace. Translation: "Hope Gives Wings to Humanity"
UNHCR and the Artists for Refugees project has implemented this artistic therapy not only to heal refugees but to also change the narrative about refugees. 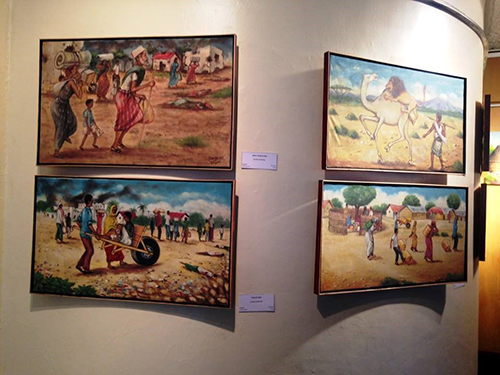 This artistic expression gives them purpose and shows the world that they have a lot of positivity and beauty to add to the new communities in which they reside. They are here as law abiding citizens that only want safety, security, and a new, hopeful beginning for themselves and their families. With the many negative stories and perceptions of refugees from the Middle East, UNHCR hopes that this project will change preconceived notions and promote understanding and compassion amongst refugees and the natives of their host countries. Christine Haddad, Art Therapist, and Carol Hammal, Art Psychotherapist have both taken their experience and expertise as art therapists to help Haitian refugees in the Dominican Republican and in-need children and orphans in Cairo, Egypt to offer a positive source for healing after the trauma they’ve endured before escaping their war-torn home country and current displacement in a foreign country. 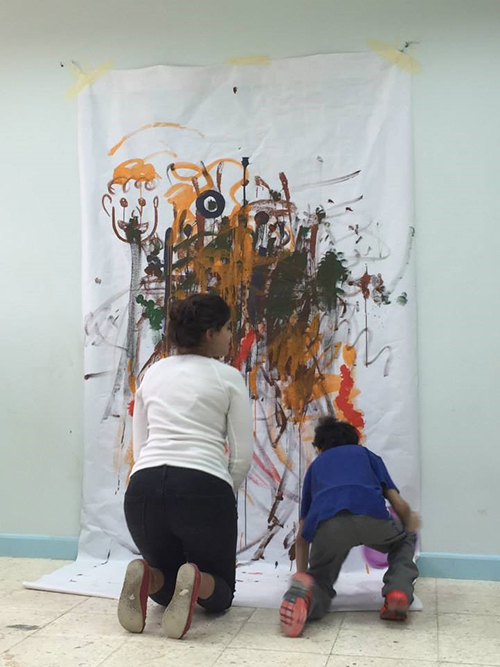 A current, ongoing project of Carol's and Care International Egypt's, "an international NGO through which [Carol is] offering an art therapy project to Syrian & Sudanese refugees in Egypt. 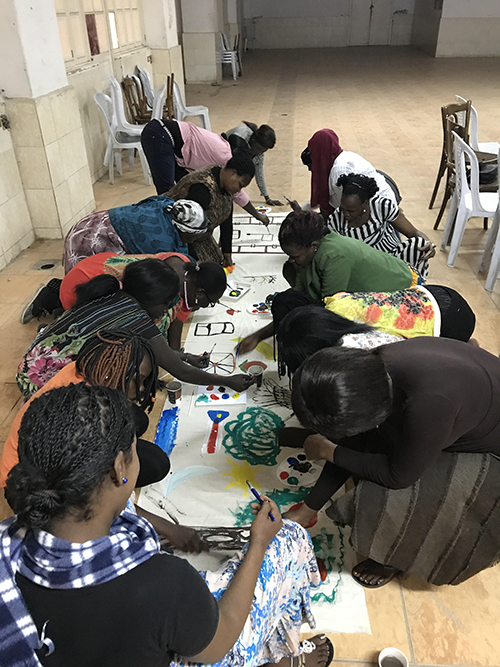 This is a dedicated art therapy project that [Carol] created to allow refugees to express their painful journey while helping them achieve closure [as they] learn new tools to help them manage their emotional pain better." Art, like music, is an easily accessible, therapeutic medium for us all to personally express the traumatic truths we try to suppress and a history that will not define who we are, but rather shows our resiliency towards the hate and violence trying to envelope us. 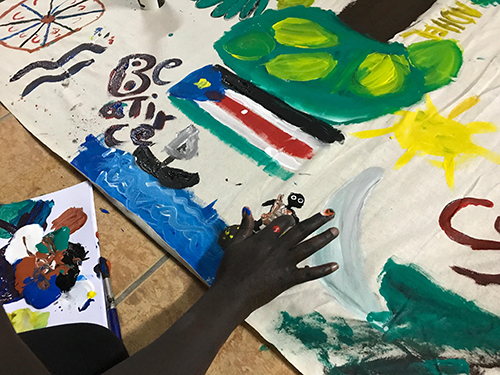 Art gives these refugees a voice to speak out and share their personal story with a world quick to silence and turn away those in the most desperate need of humanitarian assistance. 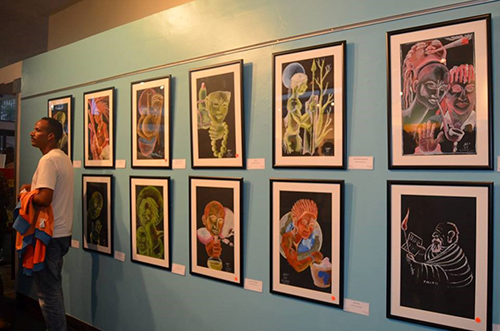 This art allows refugees to advocate for themselves, their families, their homeland in a way they never could before, a way in which people of all backgrounds, locales, and faiths will listen and attempt to understand. Creative self-expression is the beginning to a long journey of self-development and healing. 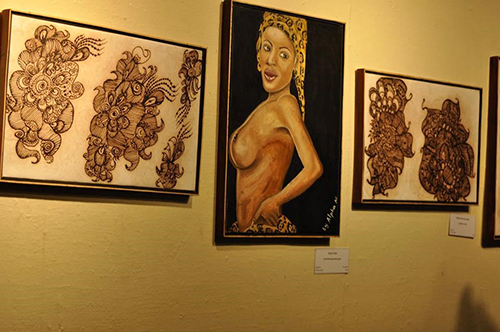 Whether it is street art, paintings, sculptures, or drawings, refugees around the globe are finding their purpose in this world and potential in themselves to reach new heights despite what they’ve endured. What all our communities need is greater enrichment in art and culture that work to give refugees, who are often forgotten or take a backseat to the chaos erupting around the war and the refugee crisis effecting Europe, the Middle East, and America, a voice against their dark experiences that is positive, uplifting, and inspirational. Melissa Rodriguez is an editorial intern for Warscapes magazine.